The Confederation of Indian Industry (CII) along with FICCI and Assocham organized a Business Meeting with António Costa, Prime Minister of Portugal and his accompanying delegation in the city. The Business meeting aimed at boosting trade and investment between India and Portugal brought together Industry representatives and Industry bodies including FICCI and ASSOCHAM in an effort to fast track business relation between the two nations. Assuring full support of his Government for Portuguese companies to export or invest in India and for Indian companies to come to Portugal. 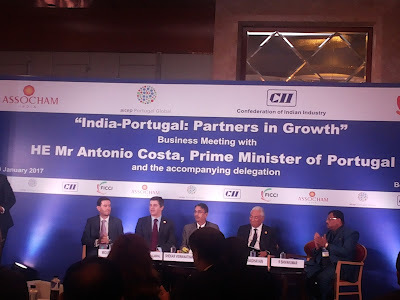 António Costa, Prime Minister Portugal said that, it is well known that Portugal and India have centuries old relationships based on historical cultural and personal ties but despite the old ties the commercial relationship between Portugal and India is still quite insignificant. Portugal export only 1200 million Euros a year to India and India exports only 500 million Euros to Portugal. Tourist flows and balance of service between the two countries is also very low. It is this situation that needs to change. The aim of my visit to India is to review and adapt our relationship to address both present and future challenges. We want to enhance our relationship and extend it to a strategic partnership with ambitious targets in new areas of cooperation. India and Portugal have complementary economies and can take advantage of being part of different regions and markets. There are great opportunities that can be explored both in terms of trade and investment. Portugal has a long tradition of openness to foreigners and to foreign direct investment. The Portuguese government has been focusing in creating a better global framework for investment, putting investment at the heat of its strategy to foster growth. Portugal has a strategic position to access key markets, it is the nearest European country to the United States and Canada, it is a country in the same time zone as the United Kingdom and Ireland and it has high connectivity to African and Latin America. The goal of this seminar is to expose both business communities to opportunities that they can explore either in Portugal, in Indian or even in CPLP countries. Manuel Caldeira Cabral, Minister of Economy Portugal said that Portugal is a very open economy open for trade and Investment from different countries, it has a long history of building bridges and today Portugal is open to being the doorway for India to enter the European Union (EU) market. Portugal is also a platform for doing business with Portuguese speaking countries all-around the world particularly in Africa and Latin America. The country witnessed the highest growth rate in the EU in 2016, investment is recovering with a strong base of Foreign Direct Investment (FDI), the country is inviting cooperation in sectors such as science and technology, Infrastructure, renewable energy, startups, agriculture and food processing, water and waste management, tourism, pharmaceuticals, automotive products and defense. Ravi Raghavan, Chairman CII Karnataka, extended a warm welcome to the Prime Minister of Portugal. He said that there is a strong need for the two nations to build on their historical relationship and transform it into a 21st Century technology driven business relationship. Portugal and India are very strong in industry verticals such as information technology, pharmaceuticals, automobiles, alternative energy, tourism, agro products, fisheries and a host of other sectors, and he called upon both countries to realize the full potential that a combined effort can bring about. He appreciated the support offered by Portugal in India’s bid for a permanent set at the UNSC. Industry representatives including Shekar Viswanathan, Chairman FICCI Karnataka, R. Shivakumar, Chairman ASSOCHAM Karnataka, spoke on the need to strengthen business ties between Portugal and India.